Acne is a mysterious skin disorder, but one thing is for sure – it can be controlled with the right combination of products, used in the correct way. Just as in a clogged drain, the pore must be treated with products that unclog it and kill the acne bacteria. 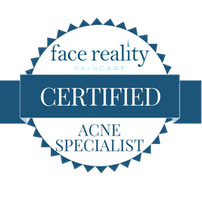 Face Reality Acne Clinic has a clear-skin system that will have your acne under control in about three to four months, depending on your type of acne. We combine the power of clinical-grade products that are customized for your type of acne, with a series of bi-monthly treatments. We also teach you about other aggravating factors that make you break out – foods, medications, cosmetics, stress, and common ingredients in skin care formulations that might be clogging your pores (even professional and prescription products). As you go through your process of achieving clear skin on your face and/or body, you will want to come in for treatments every two weeks. *Products are not included in the cost of the treatment. Expect to pay about $150 for your first set of acne products at your first appointment. We do not offer treatments or extractions to clients that do not use our home care products. We will want to see you every two weeks for an acne treatment. It typically takes about six to eight services over a 3 to 4-month period of time to get you mostly to completely clear. *Products not included in price of treatment.Expect to pay about $150 for your first set of acne products at your first appointment. We do not offer treatments or extractions to clients that do not use our home care products.